Kathmandu Valley is home to three cities: Kathmandu, Bhaktipur, and Patan. Although I always tell people I live in Kathmandu, I actually live outside of the city on the way to Bhaktapur, and I work in Patan. Since I came to Nepal, it’s been quite a struggle for me to learn the geography of the Valley and get to a point where I can aptly identify the winding, jumbled streets in the urban areas. It’s difficult not only because these areas are seemingly haphazardly organized but also because they have names that, being in Nepali, are hard for me to remember. I don’t go to Bhaktapur often (I actually haven’t been there since studying abroad because tickets are expensive for foreigners), but I’m in Kathmandu and Patan all the time and am finally starting to get a sense of where things are and how to get around. One place I’m getting to know very well is Lalitpur, a district right next to Kathmandu. Places like Kupondole, Jhamsikel, and Patan are all part of this district. My brother-in-law works in Kupondole, so from the start of our time in Nepal, Tri and I have been frequenting these areas. My new job is located in Patan, so now I spend even more time in this area, particularly along the main chowk, “road,” in Kupondole. One benefit to hanging around Lalitpur is getting to visit the fantastic restaurants clustered there. Jhamsikel is inhabited by lots of expats, drawn in by the INGO’s and NGO’s stationed there. So some great places to eat (I assume aimed at foreigners) have cropped up in that area, places like The Roadhouse Cafe and Vesper Cafe (they make some of the best pizza in the Valley). 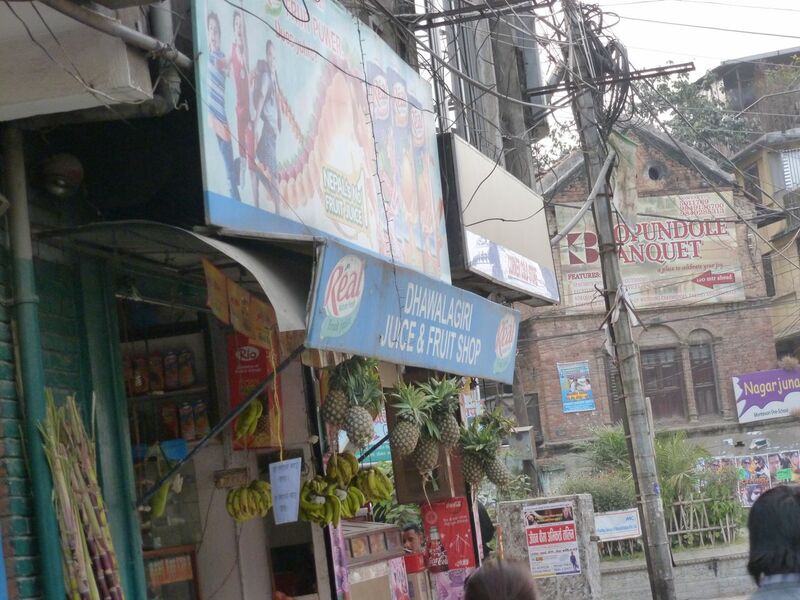 Although there are plenty of sit down restaurants showing up in Lalitpur, there are also lots of small, right-off-the-street type of places, with maybe just a small bench or a seat or two. When I talk about right-off-the-street, I don’t mean the street vendors who sell things like roasted nuts, soda, momo (Nepali dumplings), or paani puri (deep fried roti shells filled with potato stuffing and topped with sauce). 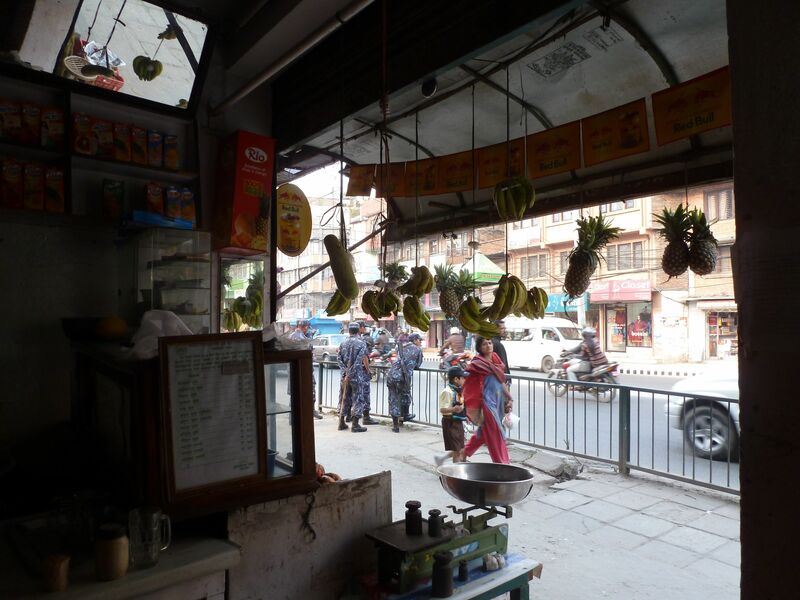 Although I would avoid the street vendors–I know many a foreigner and Nepali who ate from them and got sick–these right-off-the-street joints can be clean and have great food. A few weeks ago, Tri’s brother introduced me to a little juice shop on the main road in Kupondole, called Dhawalagiri Juice and Fruit Shop. Because I’ve have some bad run-ins with dhiarrea this fall, I was a bit weary of their drinks, but the owner assured me it’s just juice, no added water. Tri’s brother suggested I try the mausam juice. A mausam is like a tangerine but green and slightly more sour. I took my first sip and loved it! Once I had slurped down about half of it, I added some bire nun, a type of mountain salt that has a slightly sulfurous taste. The mix of sugar, salt, and sulfur was at first a little strange to my Western-trained tongue but was ultimately very refreshing. Aside from the juice, the best part about this store is getting to people watch. In the space of a minute, all sorts of things can happen on the streets. The range of emotions and states of mind is mesmerizing. As I was enjoying my juice, the policemen were talking and laughing, keeping themselves company in the cold; a man raced by hurredly on his cell phone, and an old woman and her grandson ambled by happily, presumably on their way home. All sorts of other commotion was going on as well. Buses tooted their tuneful horns and cars streamed by, a few street dogs walked briskly down the sidewalk like they had some important business to attend to, and a group of tourists with cameras hung around their necks looked about confusedly. When I stop to think, just quiet my head for a moment and enjoy what’s going on around me, it’s then that I realize how far I am from where I grew up. Usually life whizzes by, or rather, maybe I’m whizzing by the rest of life. I think part of it is the atmosphere in Nepal, part of it is being in a city, and part of it is the age that I’m at. But when I stop for just a moment and really soak in what’s going on, not only am I amazed by all of the stories unfolding around me but I am also shocked and bewildered in a grateful kind of way when I remember where I am.